As most of you would know, my name is Jitu. I’m 14 years old and today, I’m going to deliver a fairly long speech just to give you an outlook on how happy I am that mom is finally here and to show my gratitude for supporting us. This is my way of taking everyone here back to when everything started. Every adult in my family has had a rough patch with the Ethiopian government. It’s common knowledge but even I didn’t understand what was happening when the police came to take my dad. Of course, it wasn’t expected of me. I was just 4 or 5 years old. I barely understood math let alone why people were taking my parents. I can’t explain how I felt. I guess I was scared. I mean, who wouldn’t be? There were these people going through our wardrobes, taking all my favourite videos of Tom and Jerry and even our parents’ wedding tape. I remember sitting on dad’s lap, watching the policemen open wardrobe after wardrobe. My memories of that time were hazy, all I remember is that it was Friday and the next day when I woke up and asked mom where dad was, she said he was, in simple words, gone. It was a bit weird but we adapted to it. It wasn’t the worst experience but then, at that age, I didn’t even know what experience meant. Mom and I would visit dad every Saturdays and sometimes Sundays, we’d bring him food and we’d keep him company while he introduced us to his cellmates. I met a lot of good people there that certainly didn’t deserve to be there. I’m guessing I didn’t view it as a prison back then but more like a meeting hall for all Oromo people to converse at. One of the many traits mom has is dedication. When I think about it now, it’s baffling to know that someone could have the dedication to visit someone every Saturdays and Sundays. I enjoyed the visit, you had to take what you can get but to think, mom made food for dad, she walked from Arat Kilo to the bus stop early in the morning where the weather would have made the warmest man cringe to visit dad until afternoon when the weather was scorching hot. It takes a lot of patience and devotion to do that. I didn’t understand that as a kid. I just thought it was what was expected of me and grew accustom to it so I don’t get any praise. Three years later, I remember dad being released. It came as a shock. My brother, Bonsen believed that a picture of dad was his dad. When dad came home, he didn’t believe us when we told him that dad was really dad. It took him a while to understand that a picture was incapable of fathering him. It was a great day. It seemed like everything was getting back to normal. I had dad, mom, Bonsen, everyone and everything I needed until one day, I found out that dad was gone, again. The reaction I had to his second departure was more extreme that the first. Think about it, he was taken first for three years, he came back and then after one month, he was gone. I might have not cried for the first time but I did for the second. After a few days, weeks, I don’t know how long, mom told me dad was in Kenya and I had to keep it a secret. I was bad at keeping secrets, and I still am but that’s the one secret I managed to keep, well until now. I did get to talk to dad on the phone. The phone calls did make things better. I don’t really remember how I felt back then. I just remember feeling a bit sad. I didn’t understand that he was gone for his own safety, in fact, back then, I preferred the first departure than the second. At least then, I got to see him weekly. Now, I realise it was better for him to be safe and away than in danger and present. When mom was arrested, I was about 9 and had a better understanding of how things worked. I even have better memories of what happened that day. I had finished exams week and I had just gotten out of the school taxi. I was getting ready to tell everyone exams were over and just relax but instead of that, I saw my mom being carted out in the back of a police car with someone else. She saw me and yelled “I’ll be back,” but you can guess that after seeing the police, I didn’t think so. My life right there and then turned into some kind of action movie because the calm and relaxed person I was then was gone and I was rushing to our house so I could find out what exactly happened. Bonsen was there and we all know that he spent most of his life with mom. He was so attached to her that he wouldn’t even sleep unless it was on her thigh so you can imagine the state of confusion and sadness within him while mom was taken. I had seen him cry a lot of times before that. I myself have made him cry but seeing him in that state, crying, I felt really protective. I don’t really think I cried because mom was gone but because Bonsen was crying. I just hugged him and cried. That was when I really thought about the situation. “Who was going to take care of us?” “Where’s mom going?” Those thoughts were going through my head while my hands remained around Bonsen. There was Sena, my sister who was a teenager and couldn’t take care of us without a job, there was my cousin, Debela who was still in University and there was our aunty, Mestawet. I never saw Mestawet as the responsible type back then so I ruled her out as our guardian. As you can see, I was a bit self-absorbed and didn’t even think about mom until it hit me that mom was gone and of course, I pieced it to the other memory of dad being taken away and I just assumed that she was going through the same process as him and I was right. Luckily, Bontu became our guardian at the time of mom’s departure. She was great. She was just like our mother and she still is. I visited mom with her and my cousin, Debela but because we had Saturday school, I had to visit her on Sundays which resulted in me ignoring Church which made Mestawet angry since she’s a religious person. Mom was great too. I met a lot of good people there with her. One of the most confusing times was when I saw a child younger than me coming out of the prison inside. I believed that people were arrested because they did something bad and my parents were some kind of exception. Seeing the little girl there was just confusing. I think mom had noticed me staring at the girl because she started distracting me with lollies but to this day, I do not understand why an innocent young girl who was obviously not capable of doing any harm to the government in prison. When I found out that we were going to be with dad, I felt like I was in a dilemma. I was happy, I mean I was going to see dad but then I was sad too. I was leaving mom. Of course, I didn’t really have much say then. I was going one way or another. It was like a transition, from both parents to mom to both parents and then to none. Of course, when we arrived in Kenya, I was excited. Meti was waiting for us and I remember Bonsen being really shy towards Meti but as we can see, he’s warmed up to her. The minute we saw dad, it was just a moment of astonishment and shock. You see, when dad was in prison, I used to have a repetitive dream that he wasn’t really in jail but in the wardrobe. Of course, I would wake up and be disappointed after checking the wardrobe. When we saw him at the airport in Kenya, I thought I was dreaming for a few seconds until I actually hugged it. We didn’t just meet dad though, we met Ayantu who turned out to be our second mom. She had longer hair back then. Nairobi was a good place to be. I didn’t really feel like I was away from home and I had a break from school for roughly about 6 months. I even managed to learn a few words in Swahili then. In Nairobi, I had a better understanding to why my parents were arrested. It turned out they weren’t an exception, they were just Oromo people. I couldn’t get my head around why they were arrested though. Taking pride in one’s country shouldn’t have been a crime. It shouldn’t have been frowned upon; it should be accepted and encouraged. Of course, Meti and Ayantu had to leave which was pretty sad but soon after, we followed and headed for Adelaide but nothing interesting happened there so fast forward and we were in Melbourne with Meti and Ayantu. Nothing really had changed; we were just in another country. We were good with English and we had adapted quickly. One faithful day, I was on my netbook doing my Science homework when dad walked in and said ‘Mom was released.’ Honestly, I didn’t believe him because we all know he’s a joker and that I had hiccups and just thought he was trying to shock me out of it. After asking him multiple times if I was joking, he reassured me that she really was released. I started crying in happiness. Her being released was enough to overwhelm me to the point that I started tearing up. Up until she was released, I didn’t even notice that four years had gone by. I just thought if I put a time on how long she was away, it would have been longer so I avoided the topic of time. I literally said ‘Four years? Wow,” because believe it or not, I actually thought she was away for two years. After she was released, it was waiting time. A year had passed and she still didn’t have her visa granted so we were trying to fasten the process for her. We talked on the phone and it was great hearing her voice. This year, before she came, I was doing a research for school and I learnt a few troubling things about the Ethiopian government. It made me fear for her. If they lived by the might makes right code, it was obvious that they had the power to put her back in prison and no one wanted that. It made me more eager for her to be here with us, away from the dictatorship. Every night I would have made a wish for her to be with us, even if it was really childish. A few weeks ago, we found out that mom’s visa was granted so what was left was just her arrival time. Dad would keep me posted in things that were happening and I would hope the day of arrival was soon. On the 26th of July, my friend and I were watching a trailer to a film-adaptive to one of my favourite books at school, which was coming out on August the 8th. I instantly wondered if what would have happened if mom arrived on the 8th. I don’t know if it was just a coincidence but that night, I told dad about the thought I had and he told me that she was leaving Oromia on the 6th and could arrive on the 8th or 7th. I literally had a hand-made calendar counting down the days on the back of my school diary and had different scenarios of how I would greet her in my head by the 5th of August. Everyone was moving around, getting things ready and I was just sitting there with my laptop on my lap wondering how she would look, what she would wear and if she would have been the same. On the 7th, my cousin Abraham sent us a picture of mom and family members at the airport. I just stared at the picture, analysing her clothes so I would remember what she was wearing to find her at the airport. Bonsen’s reaction was priceless. He had yelled out ‘mom!’ when he saw the picture in shock. It was as if he was saying ‘She’s actually coming,’ in a shortened way. Honestly, I couldn’t sleep until past midnight. It was just to exciting but it turned out not sleeping but a bad idea because we were tired in the morning. Of course, by the time we were in the car, I was excited and practically checking Ayantu’s phone for how many minutes we had left until she arrived. In the airport, I started getting worried because she was one of the last people to arrive. Our eyes were darting around looking for her until Bontu yelled ‘She’s here’ and they started running towards her. When we reached mom, I saw Bonsen hugging her. It was strange. I just stood there stunned because I couldn’t believe I was standing right next to my mom and that Bonsen was hugging her. Anyone here would know Bonsen doesn’t hug people voluntarily so seeing him hugging her like that was shocking. I didn’t greet her until I got over the fact that she was there. I did try to stop myself from crying but how could I not? The minute we hugged, my hands were just tight around her neck and I was tearing up. I knew people wanted to greet her too but I didn’t want to let go. Even thought I was really happy, I was expecting for everything to disappear and everything to turn out to be a dream so my shock just doubled over when it turned out she was in fact really here. Even though mom is here with us and the missing puzzle to our family was complete, there are still others suffering under the Ethiopian government. There are still parents with children like me suffering and yet putting their children’s safety in front of theirs because the safety of their children is more rewarding than the safety of themselves. It’s like a constant reminder to not be selfish and not to take the things we have here for granted because people are suffering on our behalf back in Oromia. This is why we should treasure our culture and make sure their legacies are continued through us and the future generation. We owe them, I owe them a lot of things and we should never take our freedom here for granted. I still remember Hawi, Aberash, Faxe, Muda, Mesfin and many others in Ethiopian prison because of their identity, their background and political views. I wish that they could all be here with us away from the dictatorship but they’re not. I really hope one day that we could unite and live life as the big family we are without fear. Martin Luther King Jr. once said ‘Freedom is never voluntarily given by the oppressor; it must be demanded by the oppressed.’ This is the quote I now live my life to. This quote speaks the truth. It’s telling me that sitting down and doing nothing won’t help anyone or anything, we must all do something to help the ones suffering. Ethiopian Government won’t give us the freedom voluntarily we must demand it. Thank you everyone for supporting us. 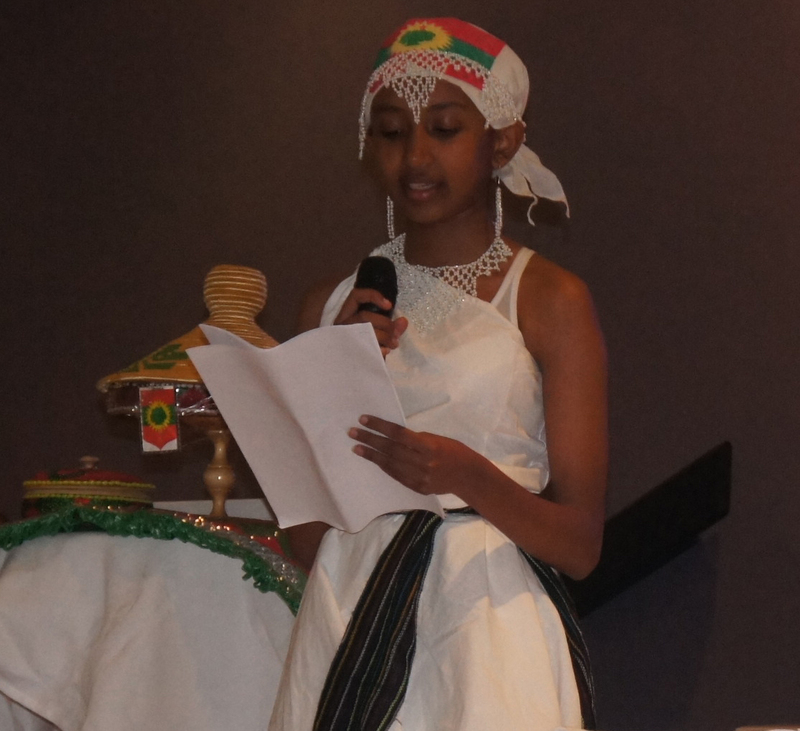 Your support and dedication motivates me to stand up for our country and Oromo people. One day, I’ll support you with whatever you need support in just like you supported me. I owe you guys and I promise to repay you. I love you all.